As a Developer, We need to test our application in all IE version. In some IE version scroll bar will appear in some others it wont appear. Sadly it behave strange in IE6 version. Its not possible to install all IE version in one machine. If you uninstall your higher IE version, you can get default version i.e IE6 version, but its not possible to install and uninstall all the time. Don't scratch your head ??? Here is the possible way to get all IE version in one machine. 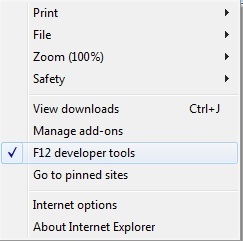 Most of you may heard about IE Tester, some of them may not come across this tool. If you guys fall in second category just go to their IE Tester Home page and download the software. For those who falls under first category just share your views here. And you can see the screen shot of IE tester home page in this post. I can able to hear your mind voice. Hey man who want IETester or out dated version say IE5.5 and IE6. I am running higher version of IE for example IE9, I want to test my application in IE7 or IE8 version. If you have above mentioned query in your mind, Yes its possible is my answer. No need to install any other software or tool to run all IE version except IE6 in one machine. It will open one window, in that window you can choose your preferred version by following this step click browser mode-->in the list select your preferred version. For example currently I am running IE9 version in my machine, but I want to test my application in IE7 or IE8.I will choose my preferred version as IE7 or IE8 in the list. So it will change the opened tab to selected version. You can see the dot symbol infront of actionError and actionMessages while displaying your result in jsp page. This is because of placing <s:actionerror /> and <s:actionmessages /> directly into your jsp page. Actionerror and Actionmessage displays result in un-ordered list format. div class="errors" and div class="messages" are not mandatory. Dot symbol will get removed and you will get the expected result. In most of the forums i found this question.How to send SMS Using java. For answering this question i spent few hours for you guys. In this Link you can download the files.Let me know if the given link is broken.So that i will upload the files and change the link here. Check the java_home twice before copy and paste the files.Because most of the problems occurred by pasting the files in wrong folder. Okay i believe you placed all files in respective folder correctly. Wait guys i heard your mind voice,you are asking where is the java program. You got the program for sending sms through java program. Want to Send Mail Using java program then click this Link and for more java program click this Link.